Steve Smith and Karla Miller took a 4-week trip with Andean Trails to celebrate Steve’s 50th birthday. 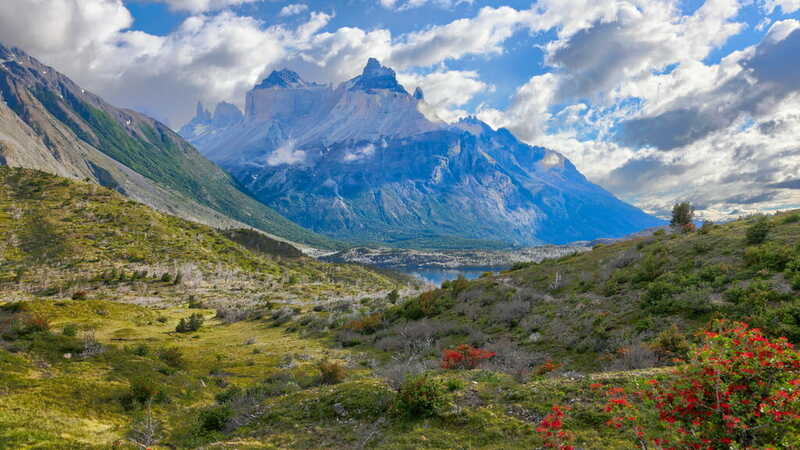 The couple started at the mighty Iguazu Falls then flew to Ushuaia to start a series of treks; Montes Martial, and then self-guided in Chalten and Chile’s Paine W in Torres del Paine National Park. “Overall, we loved the trip and found your organisation to be excellent. We definitely appreciated your prompt help while we were travelling, and attention to details (like arranging the bottle of fizz for Steve’s birthday). Iguazu: All excellent, including the guide. Having seen both sides, definitely recommend people doing that (seeing both sides over 1.5-2 days). The basic boat trip is expensive, but worth it – a distinct view of the falls. Patagonia self-guided: Overall the whole Paine W thing was excellent, including the hikes, dorms, camping, food (packed lunches very good and dinners spectacularly good food; breakfasts bland :-). Both days’ hikes wonderful and tough and worth coming to Chalten for (and we got lucky with weather). Tell people to stop off at the ranger station (just before town) when first arriving in town; we did that, and their advice on the walks and weather was very good to have. Very happy we went self-guided. Paine W – camping vs dorms: Not sure if all of the camping is so comfortable, but the tent in Refugio Chileno was big and extremely comfortable given the thicker mattresses, and if anything more private than the dorms; all the tent zips were broken, but that was no biggie. Martial glacier hike: The hike is *tough* – overall tougher than anything else in the trip as a whole (except perhaps one part of Fitz Roy in Chalten). But, as we survived it, we were very happy in the end! Self-drive, Chile Lakes: Hire car was *very* basic, and that is a good call on your part, as the driving for this part of the trip doesn’t need anything more than that! Trekking tip: For all of the trekking, we’d strongly recommend that if people ever walk with poles, it is worth bringing them, and for some of it (particularly Ushuaia and Fitz Roy) it is a good idea even for people who don’t regularly use them. Many people might not think it worth the hassle to bring their own (or rent once here), but we were very grateful to have ours (and saw a lot of people making do with sticks they found). We would highly recommend you specifically, and your company more generally, to anyone thinking of a similar trip in the future. It was great that you recommended we get setup with WhatsApp to communicate with you and the local people – the few times we wanted on-the-ground advice, that was very effective and your quick replies greatly appreciated! Overall, we loved the trip and found your organisation to be excellent. We definitely appreciated your prompt help while we were travelling, and attention to details (like arranging the bottle of fizz for Steve’s birthday). We would highly recommend you specifically, and your company more generally, to anyone thinking of a similar trip in the future. It was great that you recommended we get setup with WhatsApp to communicate with you and the local people - the few times we wanted on-the-ground advice, that was very effective and your quick replies greatly appreciated! Thanks so much Tom. Iguazu: All excellent, including the guide. Having seen both sides, definitely recommend people doing that (seeing both sides over 1.5-2 days). The basic boat trip is expensive, but worth it – a distinct view of the falls. Patagonia self-guided: Overall the whole Paine W thing was excellent, including the hikes, dorms, camping, food (packed lunches very good and dinners spectacularly good food; breakfasts bland :-). Both days’ hikes wonderful and tough and worth coming to Chalten for (and we got lucky with weather). Very happy we went self-guided. Martial glacier hike: The hike is *tough* - overall tougher than anything else in the trip as a whole (except perhaps one part of Fitz Roy in Chalten). But, as we survived it, we were very happy in the end! Trekking tip: For all of the trekking, we’d strongly recommend that if people ever walk with poles, it is worth bringing them, and for some of it (particularly Ushuaia and Fitz Roy) it is a good idea even for people who don’t regularly use them. Many people might not think it worth the hassle to bring their own (or rent once here), but we were very grateful to have ours (and saw a lot of people making do with sticks they found).